I love cats! What else is new? I secretly believe that this P.J. Salvage robe was made especially for me! February is a month of love... not because of Valentine's Day (well okay that is one reason) but because both of my cats' birthdays are in February (Sushi's is actually 2.14 and Ravi's is 2.24) and our anniversary is later the month as well! Anyways, back to the robe. I love robes and staying in one all day when I don't have to go anywhere is my guilty pleasure. I have gone through many many robes since my cats love them just as much and tend to knead on them and eventually ruin them. Hopefully I can somehow keep them off of this one because I want to cherish it forever. Cat and heart print robe c/o P.J. Salvage. 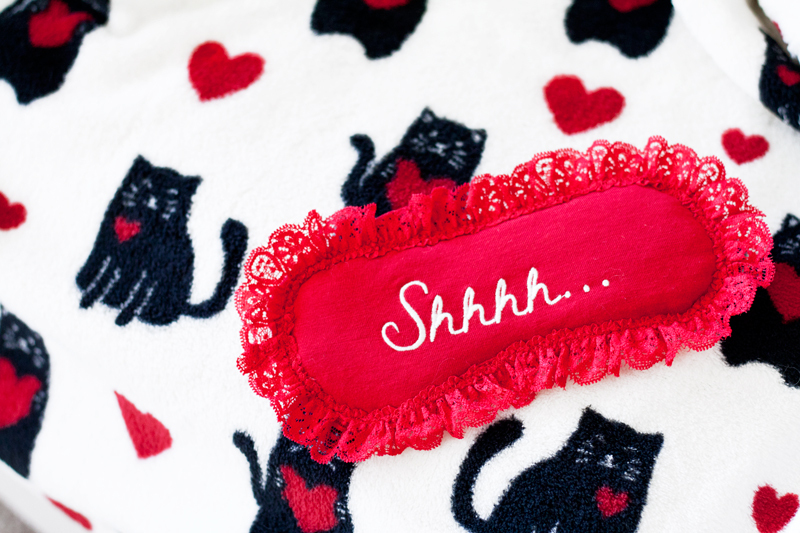 Shhhh... sleep mask c/o P.J. Salvage. Oh man this robe is so cute! What a fun print. Plus it looks incredible cozy! this is such a cute robe. I have a red one right now, they're so cozy!